La Jolla (The Jewel) is an upmarket village 12 miles north of downtown San Diego. With its dramatic coastline and year round sunshine it is the perfect destination for day trips, romantic getaways and family vacations. 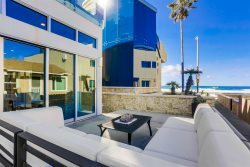 Our collection of La Jolla vacation rentals are immaculately kept and offer all the amenities of luxury. La Jollas primary attraction is its beaches: Windansea Beach is secluded with breathtaking scenery, La Jolla Shores is perfect for families with wide sandy beaches and gentle waves, La Jolla Cove is great for swimming, snorkelling and diving and Childrens Pool Beach has a protected swimming area for children, that is as popular with the harbour seals and sea-lions. Downtown La Jolla is known for its world-class shopping with upmarket boutiques and jewelry stores and a range of restaurants to suit every budget. For the visitor who wants more than the perfect beach, La Jolla has an outstanding arts and culture community. You can visit the Museum of Contemporary Art, the Athenaeum Music & Arts Library, the La Jolla Playhouse or the Comedy store open mic nights. For the active you can visit the Torrey Pines Golf course or take a hike on the trails of Torrey Pines. The Birch Aquarium provides a great ocean experience and La Jolla is a short drive from both SeaWorld and the San Diego Zoo. La Jolla lives up to its name as The Jewel of San Diego.